First – There is no explaining who gets mail from the IRS and who doesn’t. The IRS does their best when they send out mail to the general public, but nobody is perfect. Second – Take a look at your trucks, and if they travel in the US at more than 55,000 pounds, then you need to file a Form 2290 once a year. It’s that simple. Don’t let it get confusing. Third – When in doubt – call and ask. Call me at (909) 596-0050, and call the IRS internationally at (859)-669-5733. Ignorance is not bliss, and nobody wants to get turned away at the boarder. There’s really only one part of this paragraph that you need to worry about. It says that if a carrier tries to enter the US and cannot provide proof of the Stamped Schedule 1 they won’t be allowed to enter the US. That’s it. Keep a copy of your Stamped Schedule 1 in your truck, and be ready to present it at the borders. What “Treasury Regulation?” you ask. Good question! Title 26 – Chapter 1, Part 41, Subpart c – Section 41.6001-3 – Proof of payment for entry in the United States. There are a lot of details here, but again, let’s keep it simple! 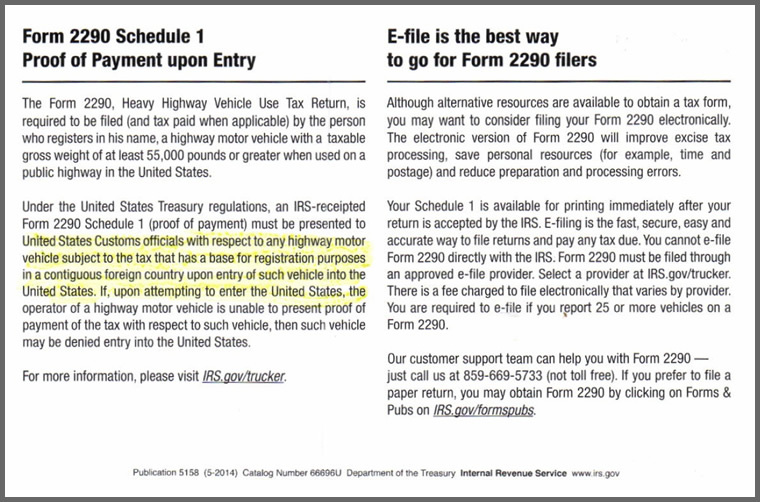 If you’re from Canada, but travel in the US you need to file Form 2290 and keep your IRS Stamped Schedule 1 in the truck.